While I’ll play pretty much any kind of game, I tend to frequent the shooter genre above everything else. Sadly, the genre has become increasingly stale, with yearly iterations of the same franchises cluttering up the market with glorified re-skins and very little originality making the final cut. Sadly, Battlefield was starting to hit that wall. After Battlefield: Bad Company 2, the franchise just felt dated. Battlefield 3 was passable and Battlefield 4 was slightly better than that (despite major connectivity flaws that plagued it for months), but the franchise clearly needed someone to take a chance on something new. That’s where developer Visceral Games comes in. Visceral decided to take a chance on changing the formula for Battlefield and took the franchise from battlefield to cop drama. 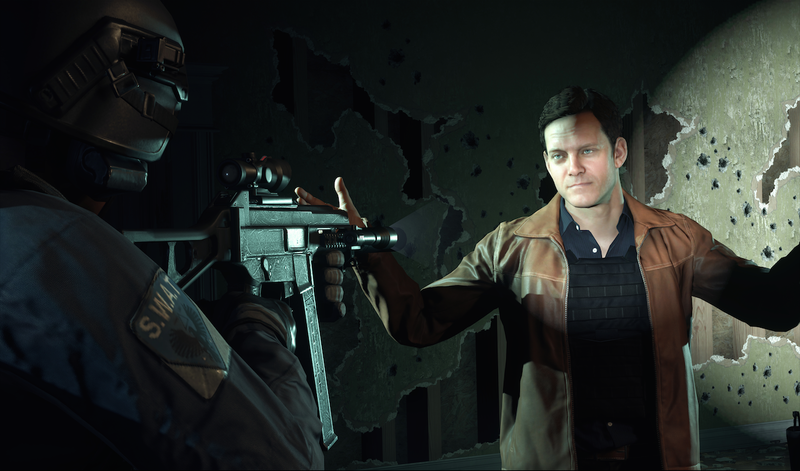 Battlefield Hardline’s single player campaign plays out like a season of FX’s awesome cop drama The Shield (it doesn’t hurt that Shield actor Benito Martinez plays a major role in Hardline). Each level is considered an “episode”, with a “previously on Hardline…” montage played when booting up the game again to catch you up on the plot. The story focuses on officer Nick Mendoza and how he handles life as a Miami detective during a heated drug war. Naturally, betrayal affects everyone. Over the course of the seven to eight hour campaign (potentially longer depending on your play style and thoroughness for collectables), Mendoza will try to bring down the corrupt and bring some balance to Miami. 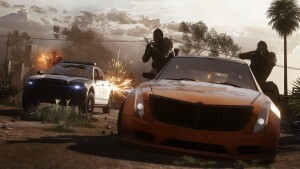 Hearing the drug angle for the plot, people will probably assume that gameplay will play out with the typical run-and-gun style that Battlefield veterans are accustomed to, and to an extent that’s true, but playing as a cop allows for a unique way to play through the story. While I can go into any situation like an action movie God, I can also choose to go in with tact and coordination. Using your cell phone, you can scan the area and mark enemies, which will display their cone of vision (similar to Metal Gear Solid) and allow you to sneak around undetected and without firing a lethal shot. Armed with a taser as one of your gadgets and a nightstick as your melee weapon, you can also non-lethally take out enemies quickly and efficiently. While guns blazing and stealth perfectionist are fun ways to play, I prefer a mixture of both. I enjoy marking all bad guys and strategically taking them out one by one with the taser, while occasionally taking one of them out with a silenced shot from my rifle. Like Splinter Cell, you’re rewarded more for stealth than guns blazing, despite having the option for both. Naturally, it’s a bit more odd to hear “Battlefield” and “stealth” in the same sentence, but it’s a surprisingly nice addition to the gameplay. When it comes to collectables, Hardline does a better job than its fellow franchise members at making collectables interesting, engaging and fun to find. While your phone doubles as a futuristic enemy scanner, it’s also used to detect and tag evidence for other cases you’ll be accumulating evidence for in order to solve. With each solved case, you’ll unlock new tiers of weapons and weapon attachments for you to use during the campaign. While I loved the unlock system I did have two major gripes: First, I don’t mind going stealthily through the missions (I actually enjoyed that more), but unlocking bigger and better guns made me want to break from my stealth play through and go run and gun. Secondly, I would’ve preferred the evidence to be a bit more complicated to find and require some Sherlock Holmes-esque gameplay to piece it all together to solve the case, but overall I enjoyed replaying levels to find the few pieces of evidence that missed. One of the other interesting pieces of unique gameplay to Hardline is your ability to collect on warrants for enemies arrests. As you’re scanning through the crowd of enemies, certain ones will have an user insignia over them, allowing you to scan their faces to discover a warrant is out for their arrests. While you can kill them like any other enemy, you can also take them down for extra XP to level up your single player character. While the end of the campaign left a bit to be desired, I thoroughly enjoyed playing through it once (and in the middle of a second full play through now that I’ve collected all evidence and warrants). The characters were engaging and the voice acting and facial animations were on point. The best part of the campaign, to me, is the player choice. While the levels were still pretty linear, the ability to play through each level in different styles gives the campaign a bit more replayability than it would probably have otherwise. While Hardline is a serious game, a few moments of well-placed comedic timing make for some lighthearted moments and shows that the developers can also make fun of themselves a bit. As enjoyable as I found the campaign, it wouldn’t be a Battlefield game without over the top high octane action from its multiplayer modes. While many of the same great game modes remain like team deathmatch and conquest, Visceral has added some ridiculously fun and addictive new modes to whet your palate. My two favorite new modes are Hotwire and Crosshair. Hotwire is basically conquest mode but with vehicles serving as the control points. 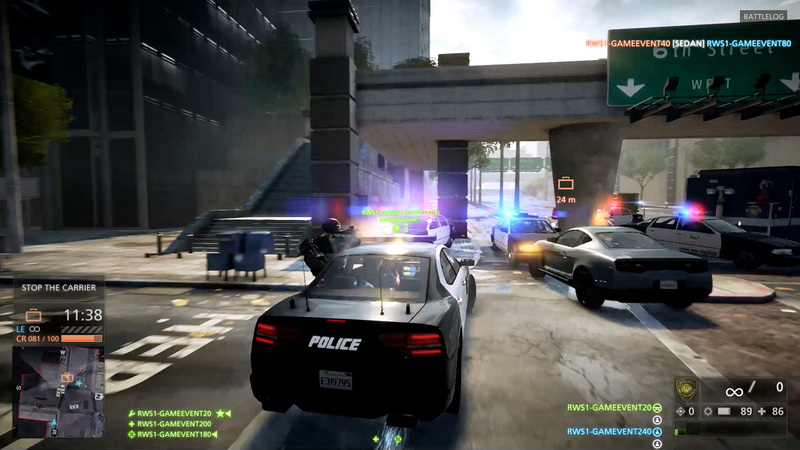 Players cruise around the map in specific vehicles in order to control the point, bleed the opposing team of their reinforcement tickets to zero or have the most when the match timer ends. It’s an absolute blast to speed around the map in the car with your friends as you lean out the window to try and shoot enemies on the move. Crosshair mode features quick three minute matches, 5v5 where every player only has one life. The criminals try to eliminate the VIP player on the other team before he makes it to a safe point while the rest of the VIP teammates attempt to hold them off or eliminate all enemy players. Matches are quick, calculating and usually pretty fun. If you’re on a bad team it can get a little frustrating, but for the most part it’s pretty fun. Heist: Criminals aim to break into a cash-filled vault or armored car and escape to an extraction point with the money. If they do, they win. The cops try to stop them and return the money. Blood Money: Teams aim to take money from an open crate in the center of the map and return it to their respective truck. The first team to collect five million dollars wins. Players can also steal from the opposing teams truck. Rescue: Like Crosshair, Rescue is another 5v5, three minute game mode with no extra lives. S.W.A.T. 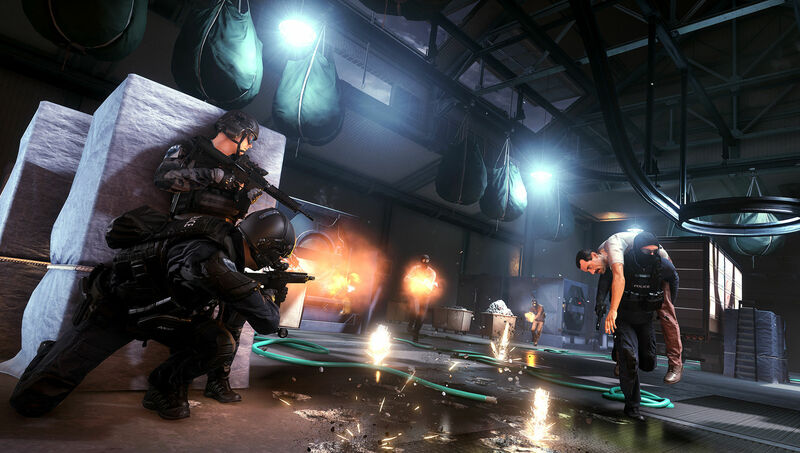 officers aim to rescue hostages and/or killing all the criminals. The criminals win by killing all the cops. While I played each mode a few times, I found myself just playing team death match, crosshair and especially hotwire on constant replay. While Xbox Live was apparently hit by a DDoS attack on launch day, I had no issues connecting to servers and quickly jumping into matches without issue which was certainly a nice change of pace from the terrible multiplayer launch of Battlefield 4. While Battlefield Hardline isn’t an instant classic or even the best in the series (seriously DICE, we want Bad Company 3 already) it’s a much needed breath of fresh air and the most enjoyable in some time. 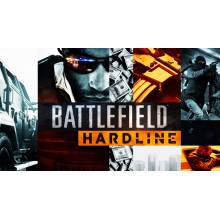 The creative and engaging campaign coupled with the franchises knack for fast passed and explosive multiplayer make Hardline a game definitely worthy of your time. + Fun and engaging single player campaign. + Play-style choices in campaign. + Same high octane multiplayer you've grown to love. + Hotwire and Crosshair game modes are a worthy addition. - Lack of character development. - Worthless AI, both partners and enemies.